This is Fetching. A pair of Fetchings? I don't know. (It's one of those collective nouns like "staff." "Staff are...." is correct but sounds dumb.) 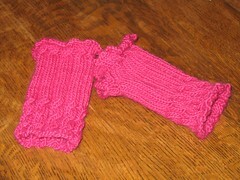 So let's just say it's a pair of writwarmers/fingerless gloves in the "Fetching" pattern. I'm very happy with them, and in a month or so I'll be wearing them in my office on a daily basis. Before that, though, they really neeed to be blocked. The picot bind-off, while cute, curls a lot. I knit the left one (I know it was the left one, because the cables are reversed on the right one) a couple weeks ago. The, on Tuesday night after I got back from Tuesday night knitting, I cast on for the right one. I finished it about 8:00 tonight. This really is a quick knit because I knit slowly and I haven't had much knitting time in the last two days. About 80% of the first glove was knit Continental-style, and 100% of the second one was, unless you want to count the bind-off. For some reason, binding off really confused me with the yarn in my left hand, so I switched back to English style at that point.